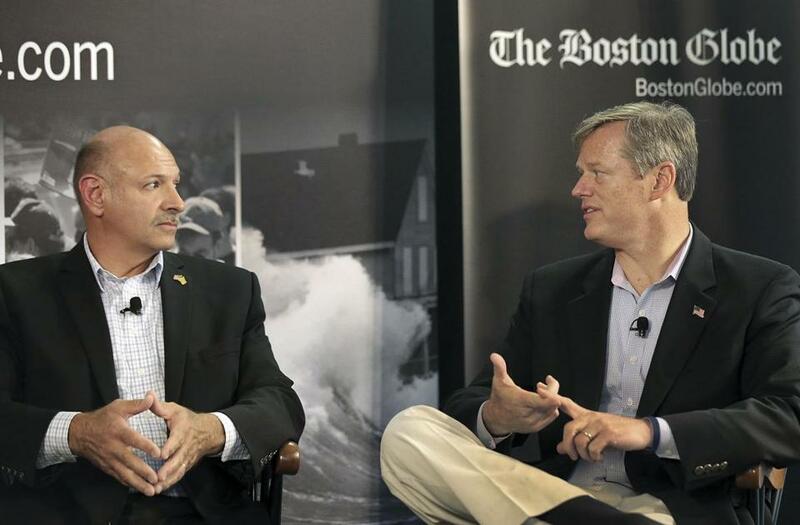 Republican gubernatorial hopefuls Mark Fisher, left, and Charlie Baker. Charlie Baker and Mark Fisher are both Republicans. At a Boston Globe OpDebate today, they both wore dark sport coats decorated by lapel flag pins and sat side-by-side on a stage. But that was about where their similarities ended. At a cordial and low-key forum, Baker and Fisher disagreed on issues ranging from how to revitalize the state Republican Party to a new law aimed at curbing harassment and obstruction outside abortion clinics. Fisher, a small businessman affiliated with the Tea Party, argued repeatedly that a dramatically smaller state government was the best route for Massachusetts and a substantially more conservative party was the best route for the state GOP. Fisher said a candidate espousing conservative positions more in line with the national Republican Party, as he does, would energize voters across Massachusetts. “Nothing makes people more unhappy with the state of their government than a government that doesn’t do a good job managing its programs, whatever programs you are talking about,” Baker said, adding he hears those frustrations from Democratic and independent voters out on the campaign trail. The candidates differed, politely, about a new law passed in response to a Supreme Court ruling that the state’s abortion clinic “buffer zone” law was unconstitutional. The law gives police more authority to disperse protesters who have substantially impeded access to a clinic. It then allows law enforcement to require protesters to remain 25 feet away from the driveway or entrance of the facility for eight hours or until the clinic closes for the day. Baker, who supports abortion rights, said he favored the new law, which he said struck the right balance between women’s access to the clinics and protestors’ free speech rights. Fisher, who opposes abortion rights, said Baker had taken the position of Attorney General Martha Coakley and Governor Deval Patrick, both Democrats. Fisher said he thinks the new law will end up in the US Supreme Court again. Baker was fluent in discussing complicated issues, including economic development across the state and health care delivery. “I can promise you that as governor we are going to have a transparent health care system, where everybody’s going to know how much people get paid for services and how they perform because I think it’s high time for the public to know as much about their health care provider as they know about the entity they purchase their TV from,” he said. But asked who a current politician role model is for him, Baker appeared completely stumped. After 31 seconds of silence and questions about the question (Ronald Reagan doesn’t count because he’s dead, Baker was told), he cited former Florida governor Jeb Bush. Fisher, for his part, quickly chose Wisconsin Governor Scott Walker, a darling of conservative groups across the nation and potential 2016 White House contender.